← Louisa Harding Duo – more patterns are going! 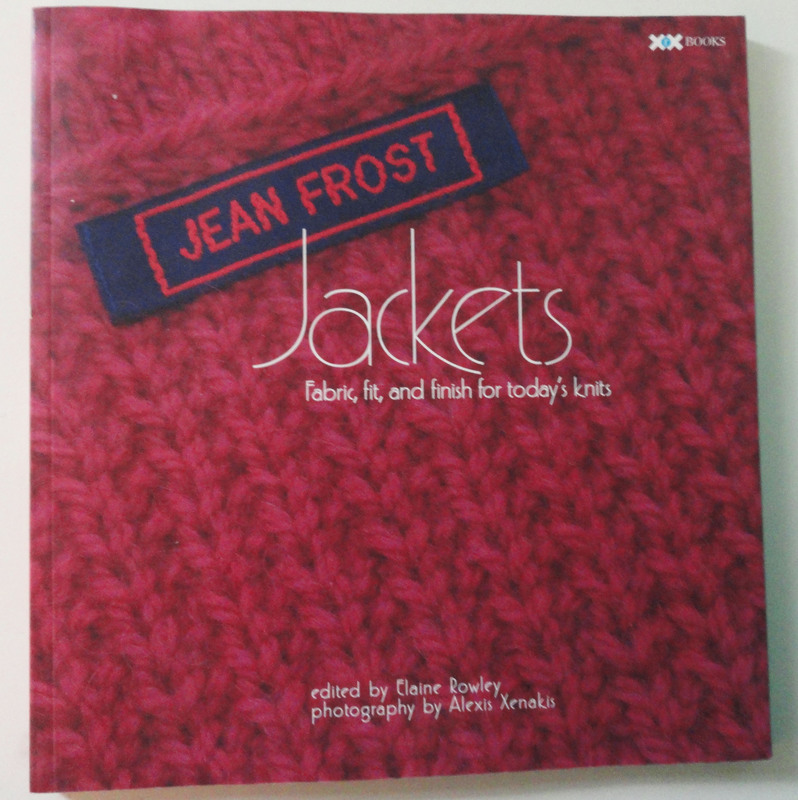 Jean Frost Jackets from XRX is my next book selection. It was published in 2003 after I left XRX although a couple of the photos were done on my watch. I’ve been thinking about Jean since I saw her at Stitches East a couple of weeks ago. She is now 88 years old and still going strong, although she has turned her teaching stint to her daughter Dawn. Amazon’s review says that: These jackets are real-life knitting for women with real lives. My take on that comment is that the book is for real-life knitting for “working” women with real lives. For a “retired” woman, the book doesn’t fit in my current life. So for that reason I’m giving it: thumbs down, but not for the usual reasons. I’m not totally ditching this book. It’s going to a good new home – that of my BFF’s daughter, Kirsten. By the way, this book is still a widely available trade paperback book and not out-of-print. 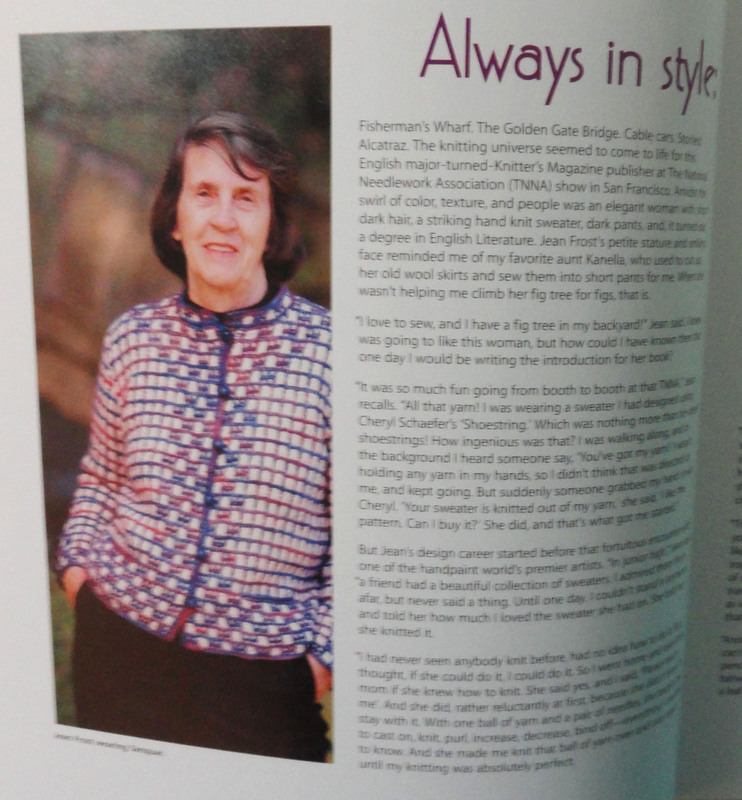 Jean looks lovely in one of the jackets featured in the book. With 21 classic jackets, this book is a bargain. I love that she talks about the knitted pieces as the fabric as you would for traditional jackets. In addition to the jackets, there a several spreads of texture and color stitch patterns if you are inclined to create your own jacket. 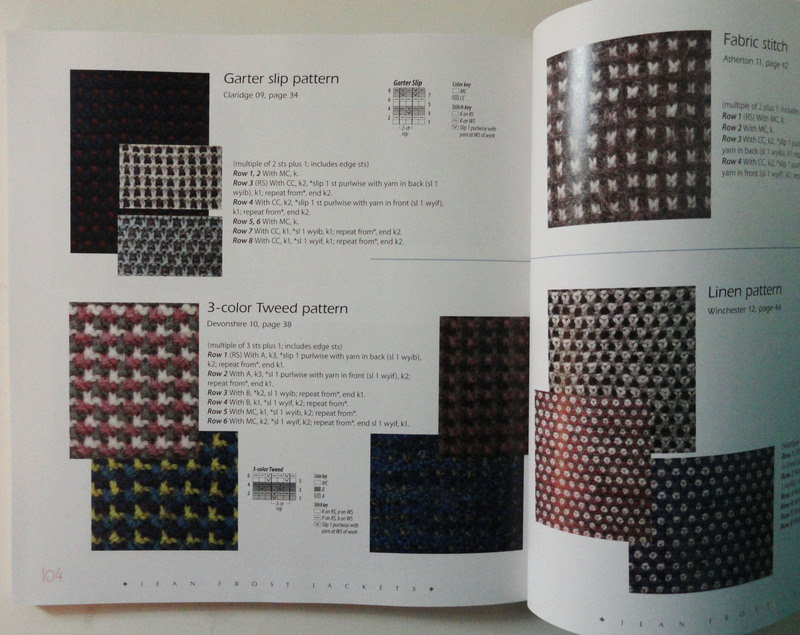 The end of the book features info on fit, size, taking measurements and yarn. All you need to know to make a jacket that you can wear for years. 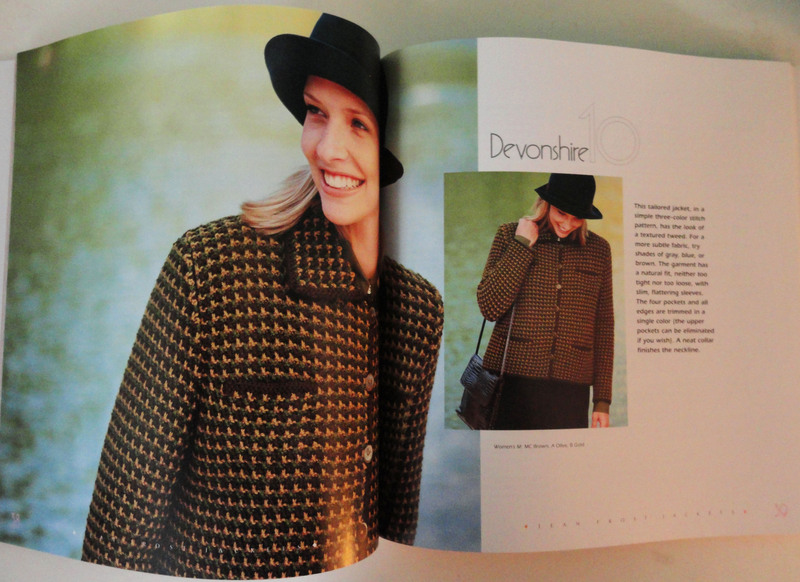 I love the Devonshire Jacket with a classic collar and a 3-color stitch pattern that looks woven. 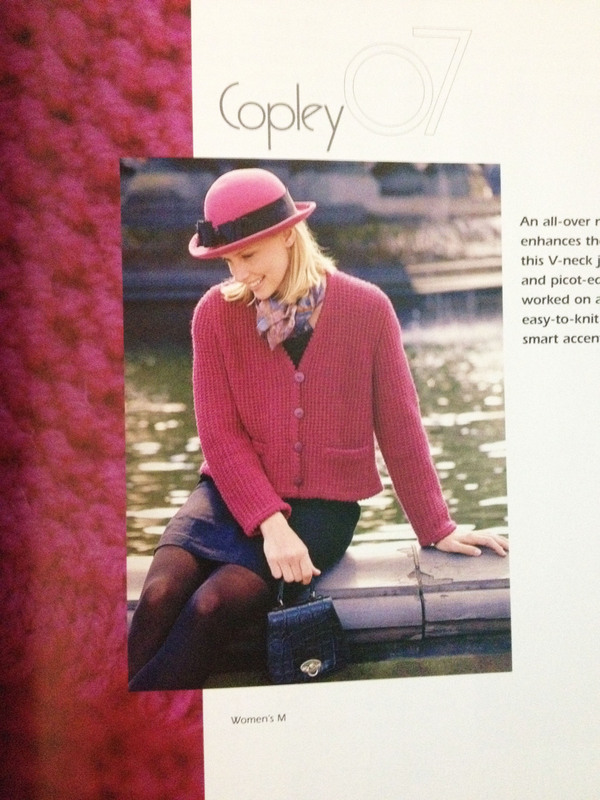 The Copley Jacket is a simpler one-color piece. I include it because it is styled with one of my hats! 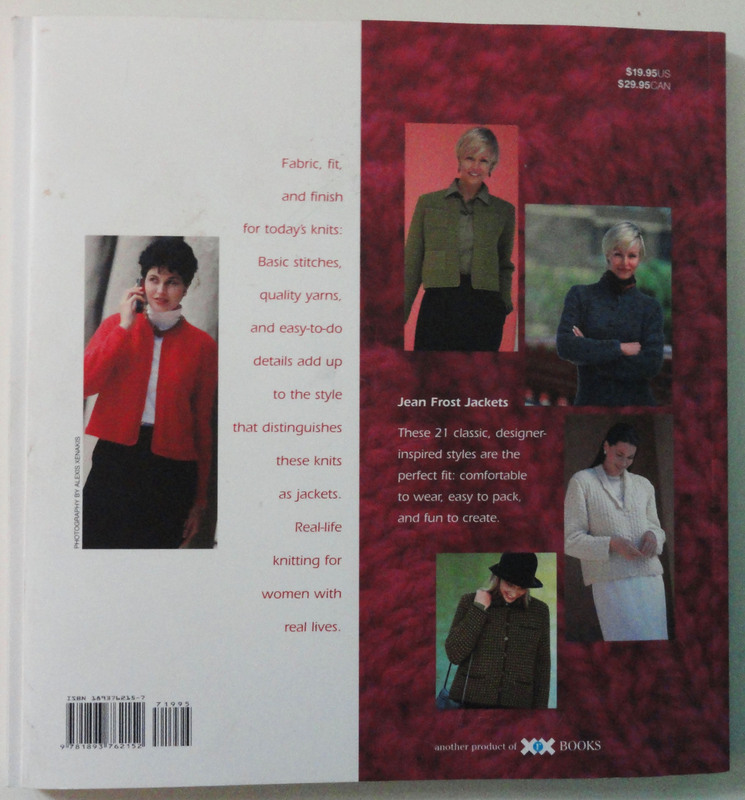 This entry was tagged classic jackets, fit, Jackets, Jean Frost, measurements, woven stitches, XRX Books. Bookmark the permalink.